This version also makes it easier to debug patterns. It surfaces both errors that our parser detects and those generated by the RegEx engine. These should usually align, but can provide additional information when things go wrong. Finally, improvements to the Details tool make it easier to dig into results, including highlighting groups within matches for PCRE. In v3 we’ve added more and better content to the Reference panel, including all (I hope) of the new syntax available to you in PCRE. To make it easier to find what you’re looking for, the Reference is now searchable. The Explain tool does an even better job of describing how a pattern works. You can roll over parts of the description in Details to highlight them in the Expression (and vice versa). Click the description to open the Reference to that token. As always, the searchable Community database provides a great way to find and rate patterns to solve specific problems. Previously, saving your work in RegExr was pretty tenuous. You could favorite patterns, but they were just saved in your browser’s web storage. That meant they were volatile and couldn’t be accessed from other computers / browsers. If you really wanted to hold on to a pattern you’d created, you had to save a link to it. Not ideal. RegExr v3 adds user accounts. You can sign in via GitHub, Facebook, or Google, and all of your created or favorited patterns will be saved to My Patterns. Patterns can now be made private, so that only you can access them. The entire Save & Share UI was revamped to be more approachable. It’s easier than ever to toss together a pattern and quickly share it with a co-worker. Hit Ctrl-S (Cmd-S on Mac), copy the URL, and share it. It’s also super simple to add your pattern to the Community from the Save & Share panel. We’ve refined the UI you know and love. Everything is easier, snappier, and more responsive. The initial load has less files, and is about 200kb smaller overall, so you can get working faster. Design has been tweaked and polished, and we’ve made the sidebar collapsible to increase your workspace. We’ve even made the whole site more mobile friendly. I don’t recommend editing Regular Expressions on your phone, but you can view a pattern someone shares with you, run a saved pattern against some copy / pasted text, check the Cheatsheet, or peruse the Reference at your leisure. Most importantly, the whole project was rebuilt with a better architecture, and modern CSS / HTML / JS. This provides a foundation for continued momentum; expect to see more regular updates moving forward. To prove that point, I pushed out a v3.1 update while procrastinating on this blog post. Take v3 for a spin at RegExr.com. Check out the issues list on GitHub to see upcoming features or fixes, and submit your own ideas or bug reports. I’m a huge fun of this page, so thank you for maintain and upgrade! !!!!!! – BIG THANK YOU – !!!!! Just load up the page for another funky regex debuging session and it turns out that the site has been updated with cool new features and fancy animations ! My favorite RegEx tool! Use it all the time and love the new user interface, especially PCRE support and color-coding, and support for query strings. Outstanding work. Thanks. a great tool which I use almost every time I have to create Regex (as a beginner). Saving my patterns is a great tool. But how to get rid of my failed experiments ? Where can I delete them? This is an awesome page! Thank you for saving me so much time! Thanks Grant! Helped us troubleshoot/test a regex again. New features are great. My goto page for regexp writing. Thanks for keeping it up and maintained! I thought it’s impossible to make it better, but you outdid yourself! 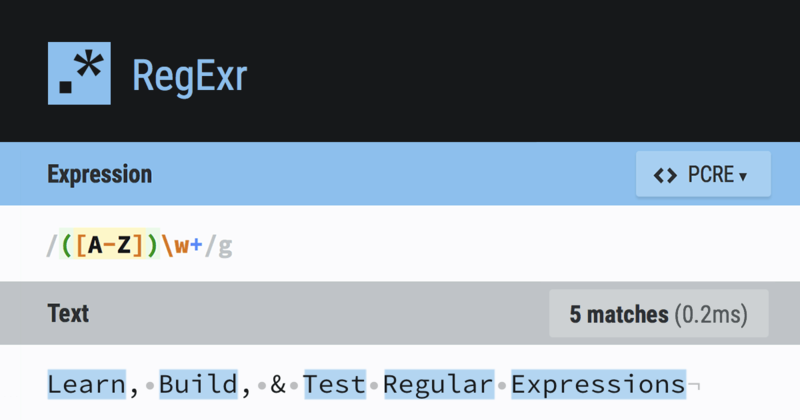 Been using regexr to solve my regex issues for years. Just want to say a big thank you to you. Very very useful tool. Thanks a lot! Thank U for you awesome tool! However I have met a big problem. But today I just cannot open my patterns no matter how I try! Could U Pls give me some help about that? Thank U!